The Life and Opinions of Andrew Rilstone: Silent But Deadly: Rhetorical Flatulence in "The Aliens of London"
Distancing devices can be deployed to great effect by Very Clever People(tm): Peter Greenaway can't seem to present a (just barely) naturalistic sequence without peppering it with a countdown of how long the film has to run, or having the audience-of-the-play-within-the-film turn around and applaud us in the 'real' audience through the fourth wall. When Who mixes Soap-naturalistic character development with playground fart-joke plots, I think its rather more likely to be extremely bad writing (possibly focus-group driven writing by committee) than a radical reinvention of the televisual form. So, yes. What you said. Its pretty obvious President Bush is not a monkey. But it does not change the fact that Berthold Brecht did have a sense of humour. Though he would have been somewhat put out that this in any way should validate his "theories" on art. So, Mr Simpson, would you like to present your rebuttal? Reading that quote back, I realise I was more scoring a rhetorical point than developing an argument. I didn’t, honest I didn’t, seriously believe you wondered what was going on whenever you turned to a Steve Bell cartoon in the Guardian. Of course you have every right to amend your thoughts. Without this, ’debate’ would be a rigid and stultified affair, where people picked arbitrary and hardline positions then decried anyone who disagreed, and the internet would... well, by and large the internet would look pretty similar come to think of it. But by you specifying it’s New Who which ill-matches the satire, you’re putting an interesting spin on it. I’d very much seen both developments as welcome. To be sure I’ve got what you’re saying... There was the cartoonist http://www.cartoonstock.com/portfolios/Annie_Lawson.asp>Annie Lawson who only ever drew stick figures. This worked fairly well for her, as her cartoons were observations about relationships, any more detail would have only got in the way. Meanwhile some comics artists, such as the later work of Paul Gulacy became obsessively hyper-real. Your argument would be that satire and soap work together about as well as a Lawson and Gulacy team-up comic would, the two styles intrinsically vie with each other? Tarka the Otter’s all very well, but we don’t want him turning up on Animal Farm. Rose and Jackie and Mickey and the Doctor are apparently real people, but the characters inside Downing Street seem to be turning into cartoons... the presence of the Slitheen satire makes it impossible for us to continue to take Rose seriously as a real-world character. To me the counter-argument lies in an apparent idiosyncrasy of satire. Satire builds a 2D world where only 2D characters can be placed, whereupon it pillories them for this very flatness. Bob Black called John Crawford’s gonzo punk character Baboon Dooley “superficial to the very core of his being.” Which is a great line until you realise all satire characters are built like that, it’s simply the way you have to be to live on the satire side of town. How do you depict someone who’s a monster but put someone next to them who isn’t a monster? So what do you do with a 2D character but put them by a (by contrast) 3D one? There was once an old, funny comic called Cerebus. (Unfortunately this often gets confused with another comic by the same, despite that not being around till later.) But the old, funny Cerebus would often lampoon superhero comics. This is pretty hard to do as they are so absurdly exaggerated anyway, the normal tricks won’t cut it. But Sim didn’t exaggerate the way his superhero-comic characters talked, so much as place them alongside other characters who didn’t talk that way. It’s the old trick of giving a comic a straight man, only with a twist. Of course this isn’t the same thing as ignoring genre. On the contrary, you have to build each genre up note-perfectly to make it clear we’re watching a juxtaposition and not a mismatch. One or the other of us is getting the parameters of this wrong. I’d taken Andrew’s point to be that the two genres didn’t fit together due to intrinsic differences, not that Davies lacked the skills to splice them. If the debate’s just about Aliens of London, I’d have to say it seems somewhat overblown. I liked the idea of monsters so unprofessional they break out into celebratory giggles when they get into the Cabinet Office, and the Military Stiff who doesn’t know how to react to it. It was better than the standard ‘Goldfinger Will Now Show Us His Cunning Plan’ moment, which was what I was expecting. It wasn’t the best episode of New Who, not even of the first series of New Who. Maybe the episodes either side of it were better. There were funnier fart jokes in Blazing Saddles. Finally and somewhat tangentally, I haven’t seen the episodes since they were broadcast. But did Rose interact with the Slithene that much? I don’t remember her doing it. That link again, just in case anyone needs an illustration of what a stick figure looks like. Cerebus being a satirical version of Conan the Barbarian. And is 4 - dimensional. What Mr. Rilestone is trying to describe is closer to "Latter Days" (in part, a satire on Superman) than any of the Roaches. Andrew is right in the shape of his argument, of course. Where I'm not so sure is in the idea that Rose and Mickey were ever characters out of a soap opera. Certainly in their first episode, 'Rose', they were characters out of season 24. As was the Doctor, as was Jackie. As was for the whole first season. Except in Steven Moffat's two-parter, which is why old-school fans like it more; and in 'Boom Town', which is why new-school fans like it less. I'd been waiting for this article to resolve my conversation with Mr. Burrows (on this point) in the previous thread. I finally came to understand that Mr. Burrows's point was that all satire, by its nature, must break mimesis and remind us that we're watching a fiction. I think there is an excellent chance that Mr. Burrows is correct on this (though I might argue that The Sunmakers and Carnival of Monsters were satires and they didn't break mimesis). But, if we grant that this is correct, then my answer to his question, "Are you saying that Doctor Who shouldn't do satire?" is "Yes, that's what I'm saying." I will, however, continue to defend The Gunfighters and The Chase, both of which were quite funny and entertaining without breaking mimesis (though just barely). And I am one of the few old-school fans who defends those two stories, instead of viewing them as embarrassments. And, by the by, I find The Threepenny Opera quite funny. However, Brecht must have been quite annoyed that it was so popular because the audience loved all the mock sentimentality and completely missed the joke. At what point is the viewer of the satire or non-satire unaware that he is watching a fiction? I’d taken Andrew’s point to be that the two genres didn’t fit together due to intrinsic differences, not that Davies lacked the skills to splice them. I agree: Mr Rilstone's thrust seems to be that the juxtaposition is intrinsically jarring and therefore unacceptable. My point was trying to be that in certain rare circumstances such jarring effects can be deployed for valid artistic reasons, but that in this specific case I doubt that the distancing was intentional. I can't comment on Whether Davies can use the technique successfully. My suspicion is that he lacks the respect for the audience of 'this kind of thing' to even try. Why waste good writing on sci-fi fans? They're happy as long as the CGI budget exceeds some threshold. I propose the 'Blakes7' (B7) as the unit of BBC effects budgets, and would set the threshold for New Who at around 8 B7s (a Hollywood blockbuster would come in at around the 1kB7 mark). Never, of course, but I fail to see how this is relevant to whether the fiction should be reminding you that it is fiction. I liked the satire they did of ‘Conan Becomes the Pope’, that was a good one. Not as much as his missis. Helene Weigel, Brecht’s wife and leading actress, ‘broke mimesis’ quite firmly at the opening night of its successor Happy End. She dispensed with the script to tell the theatre-going audience they were all petit-bourgeois types who would be swept away by the upcoming proletarian uprising. They don’t write ‘em like that any more! My suspicion is that he [Davies] lacks the respect for the audience of 'this kind of thing' to even try. Why waste good writing on sci-fi fans? Davies may often be a lazy writer. He creates set-pieces he likes, and doesn’t always pay attention to linking them up. But he’s more likely to cover plot holes with emotional epiphanies than special effects. And I’m not sure any of the above suggests he doesn’t have any respect for his audience. This is akin to saying “George Lucas gave us Phantom Menace because he hates us fans.” It seems to me more likely he was just uninspired. And saying “this has good special effects but lacklustre writing” does not prove the case that anything and everything with good special effects must have lacklustre writing. Preferred the King David satire, personally, though the ideas expressed were nearly completely the mirror opposites of my own. (The exception being that bit about furries as the Beasts of the Apocolypse). "Helene Weigel, Brecht’s wife and leading actress, ‘broke mimesis’ quite firmly at the opening night of its successor Happy End." well, made mimesis out of breaking mimesis, anyway. "They don’t write ‘em like that any more!" Why should they, when wearing a burkha, or just being Brazillian, is so much more effective? "And saying “this has good special effects but lacklustre writing” does not prove the case that anything and everything with good special effects must have lacklustre writing." Indeed, one understands that Content & Spectacle might even support each other; if you would excuse such a Gothic!ally barberous opinion. Unfortunatly, due to current "event" theory (based, as far as one can understand, on measuring the mechanical reactions of our brains & ignoring what they are actually reacting to) such synthesis seems about to be ground below the juggernauth of "post" modernist dialectic dualism. Does anyone in this discussion have a coherent idea of what they mean by 'mimesis' and is there even the slightest chance that any two participants' ideas might be even remotely similar? 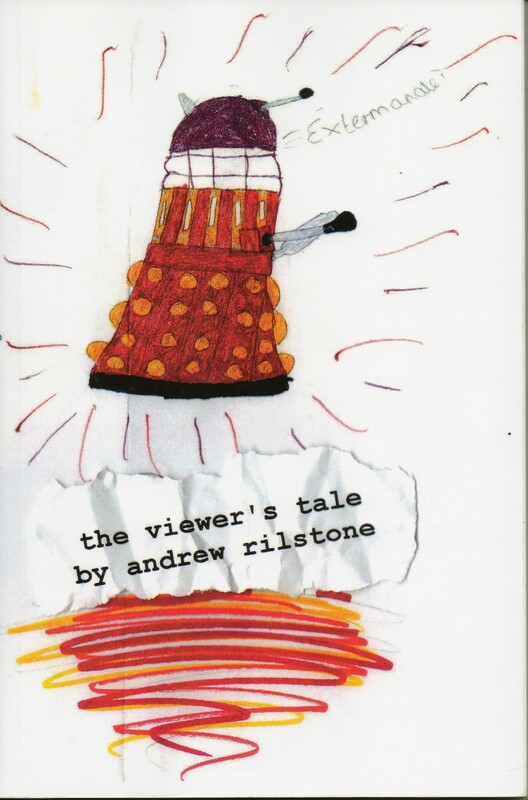 Mr Rilstone does not object to the mix of soap and satire, as can be seen from his argument that it would have been perfectly in keeping with the style established in Rose to have, say, the TARDIS materialise on a planet on the brink of a war which has obvious parallels with the Iraq war. His objection is to the series first establishing its frame of reference and then, when convenient, standing outside that frame, in the manner of a stand-up comic who inhabits a character only partially, winking at the audience two show them that he is in on the joke as much as they are. This is not quite the same thing as Brecht or Greenaway, as their gimmicks are part of the milieu indeed part of the entire point of what their work is about. The frame of reference of Mother Courage and her Children, as well as being among the most boring crimes ever perpetrated on a stage, includes the distancing devices. Brecht doesn't present a naturalistic depiction of way that he then steps outside when convenient,all the while winking at the audience and inviting them to share the joke: he presents a deliberately non-naturalistic depiction and that is his medium. Doesn’t Gunfighters ‘break mimesis’ quite firmly in one infamous moment? Not that I can think of. The Daleks' Master Plan does, of course ("A happy Christmas to all of you at home"), but that episode ("The Feast of Steven") is quite clearly an example of "all the rules are off for this one episode only." The episode has literally no effect on the epic surrounding it and one can easily pretend that "Coronas of the Sun" leads straight into "Volcano." One could make a similar argument about the two episodes of The Chase you're referring to where they land on the Empire State Building, the Mary Celeste, and a haunted house in Ghana in 1996, although those episodes do have an effect on the story around them. I can't think of any similar incident in The Gunfighters. Of course, arguably it does break mimesis since it's not even remotely historically accurate and, of course, it's got that song narrating the action throughout. You really ought to watch it, by the way. It is one of the Hartnell era's greatest experiments in that most experimental of eras. Fiction always reminds you that it is fiction, in the same way that a horse always reminds you that it is a horse. Or in otherwords some people can stand their fiction to have more elastic walls than other people. I take it that you never engage in what is called "willing suspension of disbelief." Nothing wrong with that (admirable in a way, in fact), but I can assure you that your method of imbibing fiction is not the only such method. Unless, of course, the author ensures that it is. What's your evidence that the Iraq war happened inside Rose's world? The PM who dies isn't Blair, the new PM doesn't exist in the real world(tm). The UN doesn't control nuclear codes like that in the real world, but it might in the World within the show - something similar is part of the plot of 'Robot'. You seemingly demand that there can be no level of realistic characterisation, unless there is historical and political accuracy, at the level at which a passing satirical dig would be impossible without in world comment. This is a bit daft. Dislike the episodes by all means, but when has Doctor Who been a realistic political drama in *any* of its depictions of whitehall over 45 years? Did the existance of all the farcical civil servants who bumbled and hindered the 3rd Doctor 'spoil' Jo. Did a pre-Thatcher female PM in 'Terror of the Zygons' who is - offstage - presented as a bit of a battleaxe, hinder mimesis of Sarah Jane? If the many things Coleridge has to answer for, that bloody phrase is surely near the top of the list. Harriet Jones: The British Isles can’t access to atomic weapons without a special resolution from the UN. Rose: Like that’s ever stopped ‘em. Harriet Jones: Exactly, given our past record. And I voted against that, thank you very much. The codes have been taken out of the government’s hands and given to the UN. Is it important? I'm being a bit of a smart arse, of course, but I really do struggle to think of any piece of fiction that doesn't signify, at some point, that it is fiction, or encourage us to look at it that way. Fiction, almost always, has a beginning, middle and end. That's usually enough. I think Andrew R's point isn't so much that 'Aliens of London' mixes psychological naturalism and satire, but rather that it mixes naturalism and farce. I think he is correct; where I challenge his argument is in that, as far as this viewer understands it, 'Rose', 'The End of the World' and 'The Unquiet Dead' were also a mixture of naturalism and farce. Simon BJ, it is also implied by the exchange the Doctor has with Rose. One of them asks if the public would fall for the "massive weapons of destruction in 45 seconds" bit and the other says, "They did last time." Nobody is asking that Doctor Who be a realistic political drama (or a political drama of any kind). Salisbury, I can think of several works of fiction which do not present themselves in any way as fiction, in particular the kind which are trying to pass themselves off as factual (most memoirs). I am, to a certain extent, on your side. My wife is, on occasion, moved to tears by a work of fiction. This has never happened to me. I am simply not capable of that level of immersion in a story about things that never happened to people who never existed. But she is so long as the author doesn't actively (or passively, through incompetence) prevent it. ...is there even the slightest chance that any two participants' ideas might be even remotely similar? ...he is probably confusing satire and allegory. Wasn’t the argument that things satire inherently has to do involve pushing us outside that frame? The series often foregrounds genre conventions. Normally you're not supposed to ponder on the likelihood of the Doctor meeting Donna twice, you just accept it as a story enabler. Then they suddenly pick it up and wave it at you. The risk here is that by flagging up some conventions they’ll expose and undermine all of them, and bring down the house of cards we’re watching. ...which shares not a few parallels with what Andrew said. In the early days the Tardis was supposed to land randomly. Except it always landed alternately at a point in Earth’s history, then on another planet, then back again. You could make smartarse comments about that, or come up with convoluted cod-explanations. But you were better off just accepting it, as the sort of groundrule the series needed to keep going. But a problem arises if one week you show us the man behind the curtain, then the next tell us not to worry about him. In short, I’m starting to think Andrew has picked the wrong example of a genuine concern. I can think of several works of fiction which do not present themselves in any way as fiction, in particular the kind which are trying to pass themselves off as factual (most memoirs). It’s interesting the way so many novels were faux-memoirs. Robinson Crusoe, for example, isn’t just written as though narrated by Crusoe, it takes the form of his life memoirs. This wasn’t intended fraudulently, I don’t think it was ever published as if written by Crusoe. But its like early novels had to take on a recognisable form. Apologies, my error! Of course that was the example I was thinking of. I think Andrew R blogged about them together once, which is possibly how they got mixed up in my mind. You really ought to watch it, by the way. It is one of the Hartnell era's greatest experiments in that most experimental of eras. Andrew, I’m starting to wonder now. Are there any Hartnell episodes you don’t like? Not many, but you shouldn't let that stop you from watching "The Gunfighters," which is not just a Hartnell episode I like, but one of my favorite Doctor Who stories, full stop. The people who hate it are really po-faced fans of the kind Andrew Rilstone is often wrongly accused of being (even in this thread). But "The Gunfighters" is great, no matter what. The Discontinuity Guide says: "'All these people are giving me guns, I do wish they wouldn't ' With Hartnell, Purves [playing the companion Steven] and Anthony Jacobs [Doc Holliday] in amazing form, and such a great script, this is a comic masterpiece, winning one over with its sheer charm." And Mssrs. Cornell, Day, and Topping are only wrong about Sylvester McCoy. Please to be assured, I am not confusing satire and allegory, but know exactly what I am saying, have read the rest of the discussion,and am not repeating any of it (I would mention it is I were). Satire doesn't have to push us outside any kind of frame. The Thick Of It is a satire, establishes its frame and doesn't go outside it. Please to be assured, I... have read the rest of the discussion,and am not repeating any of it (I would mention it is I were). This is not quite the same thing as Brecht or Greenaway, as their gimmicks are part of the milieu indeed part of the entire point of what their work is about... Brecht doesn't present a naturalistic depiction of way that he then steps outside when convenient,all the while winking at the audience and inviting them to share the joke: he presents a deliberately non-naturalistic depiction and that is his medium. One of these things is exactly the same. If you'll read mine, you'll see that nowhere am I talking about whether actors stay in character, but rather I am talking about the devices such as the songs or the titles (if they're shown) in Mother Courage and her Children; or about the narrator in The Resistable Rise of Arturo Ui. For I do not think that the issue of 'staying in character' is relevant to the discussion, as no actor in Doctor Who 'breaks character': the issue is the devices, specifically the reference to the non-diegetic world. So no, it's not a mere repeat. Thanks for the pointers, though you warned me too late about The Web Planet. Others have said the first episode of Space Museum is good, though i dare not watch it because I would inevitably then watch the others. I'm thinking of writing about the ones I watch on my blog, so I won't clutter things here. I suppose I'm with the majority, as I'm late Pertwee/ early Baker era, and will insist that its by pure co-incidence this was the very best era. I read a blog on Barbelith lately where everyone went on about McCoy, which made me feel old. I'd love to read your reviews. I'll try to keep an eye out. I should also say that there are a couple of other Hartnell stories that I don't recommend trying to watch all in one go, notably "The Sensorites," "Keys of Marinus," "Dalek Invasion of Earth," and "Daleks' Master Plan." I do believe all of those are perfectly watchable and even quite enjoyable at a pace of an episode a day (the pace I was forced to watch them at originally). One of the reasons I love Season 3 (most of which is sadly lost) is other than the 12-part "Master Plan," every story is four episodes. Pity they didn't realize what a good idea that had been for the next eight years. I am currently going through yet another cycle of watching every episode in order (currently at The Abominable Snowmen at the beginning of Season 5, so I've sadly finished all the Hartnells). The more times I do this, the more sure I am that I'd like Troughton's era almost as well as Hartnell's had it not all been junked. (Patrick Troughton is a fantastic Doctor, saddled with somewhat less creative scripts.) By the time I get to the end of Season 5, I'm always heartily sick of the reconstructions. However there is apparently a fan movement to animate all the lost episodes and I'm hopeful that will go somewhere. I'd love to read your reviews. I'll try to keep an eye out. Amusingly I started with the idea to only watch the good episodes. Of course that didn’t include those stuff historicals. Then people suggested I watch The Aztecs, so I was forced to acknowledge the existence of the good historical and add them to the list. Then it somehow shifted to me watching all the episodes except the bad ones. At least up until the Baker era, perhaps the Davison one. The Space Museum is definitely out, though! You’re right about four-parters. The Daleks could be cut down to four parts and lose nothing salient. A while ago, The Time Meddler was repeated on UK TV and I found it far too slow. I watched it again recently, after some of the other episodes and it fairly sped by! Umm... that'd be stuffy historicals!